i know that you believe you understand what you think i said, but i'm not sure you realize that what you heard is not what i meant. - Cam. James. Vulchek. Hoover dam the man is good looking. My friend gave me the best present ever today which is a picture of his GAP ad. He is fantastic. I love him to death and am so sad that he died! - The characters they picked all fit the parts extremely well I must say. Edward and Bella especially fit so well with eachother, they had good chemistry. - The only time Edward was attractive though was when he had the Raybans and the leather jacket and smiled. Oh then he was good looking I have to say. - Baseball, that was fun. Jasper especially was fun to watch. Okay hot when he's spinnin the baseball bat. Love it. Although agreeing with Ab on his eyes, dude don't open them so wide. - I wish the family talked more, I think that would have been better. I think the next movies will be better because they talk more, hopefully. - Jacob was cute, good thing he's only 16 so he can get bigger! - Their house was amazing, I was hoping for that to be really good and I wasn't disappointed. - Too bad it was low budget because the cars were disappointing, although that jeep is my dream I must say. - Running - lame, could have done better, I realize it's hard but the blurred arms moving thing was not so cool. I saw it. I laughed. I'm excited for the next books. Overall good movie because the characters fit really well and it was a love story. I'm excited for the other ones and I still love the books and it did not ruin anything. The person who invented the lint roller. Such a simple invention but it saves my sanity when I'm covered in dog hair, my car is covered in dog hair, and all my clothes are covered in dog hair. Thanks. And that's also why I have dogs that don't shed. I love dogs but the hair is something that needs to be overcome. I love stuffing. I crave stuffing. I go to Boston Market all throughout the year just to get stuffing. Thanksgiving and Christmas are the best times ever because people make me stuffing. 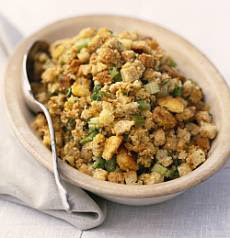 I love leftover stuffing cold or hot, doesn't even need gravy. I just want the stuffing. I can't wait for stuffing! I recently traveled to the foreign place of Austin Texas to visit my best friend Lauren and while we were there we went to whole foods to eat. Apparently Whole Foods started in Austin so the one there is ridiculously large. But the point of this ramble is that they are advertising buying your thanksgiving dinner through them, so they were giving out samples.... of stuffing. Real home made stuffing with sourdough bread and it was the best stuff I have ever eaten. I can't wait for stuffing. So I'm sure we've all had the same kind of experience, where something happens and we have this whole conversation with ourselves, reason things out, come to conclusions, laugh.... all in the space of .025 seconds. It's an amazing thing, how fast your brain works. Here's an illustration. Haha Story time!! So last night I rode my bike over to my friend's house for our weekly gossip girl night. Then I'm riding back, and I reach with my right hand to turn on the light, so that I'm safe, I do try and be safe. And I realized I was coming up to a road so I thought, oh I should slow down, which I then do with my left hand. Anyone who knows a bike knows that the front brake is on the left and the back brake is on the right. So when I did that, I hit the front brake. Future warning.... NEVER DO THAT. Just hitting the front brake is so not a good idea, it causes you to flip over your handlebars and slide down the asphalt tearing up your side. But here's the point of the story, in the time that I subconsciously decided I needed to hit the brake and hit the brake I had a whole conversation with myself. Well that's an understatement, I had a screaming match with myself. I reach for the brake and then start screaming at myself. NO!!!!! YOU NEVER HIT THE RIGHT BRAKE YOU'RE GOING TO FALL AND BREAK YOUR IPOD THAT'S ON YOUR LEFT SIDE. NOOOOOOOOOOOO!!!! And then I hit the pavement. And I'm sliding down the pavement still thinking, Yup, that just happened, now you've done it. I told you that was an idiot move! See you can already feel your bruised hip. Good Job Heidi! Ha I was thinking about that little conversation on the way home when I'm riding with one hand. Those things happen so fast! Just like when you have a moment when you do a double-take and try to process what you've just seen. Whole conversations that take minutes and minutes to explain or actually have just take tenths or less of a second to have. Priceless.